Backing is produced from HDPE via extrusion process followed by specifically oriented stretching. This stretching procedure ensures required heat-shrinkable effect, i.e. enables the material to maintain initial dimensions when heated. The backing ensures high indentation resistance, impact strength, electrical resistance and low moisture absorption of the coating. To maintain special mechanical strength and ultraviolet radiation stability the backing is treated with irradiation cross-linking process. Polymer materials in general consist of randomly oriented long chain molecules. Intermolecular spacing and crystal lattice pattern play the predominant role, i.e. the less intermolecular spacing is and the stronger the crystal lattice is, the stronger is the polymer. Heating of these molecular structures to above 120°C destroys the crystal lattice, which results in the molecules moving freely relative to one another without any mutual bonding. This causes buckling and unpredictable shaping of the polymer. 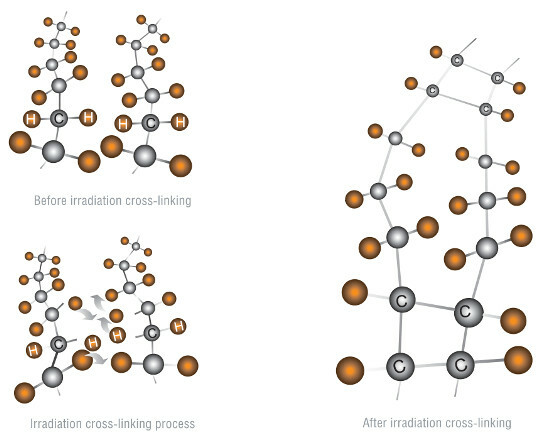 Irradiation cross-linking process serves to modify properties of polymer materials. When treated with accelerated particles delivered by irradiation, polymer molecules produce permanent transverse cross-links, i.e. become cross-linked. This treatment results in the so-called ?elastic shape memory? - effect of the materials that 'remember' their initial shape and 'recall' it after heat treatment. The 'memory' degree or the material shrinkage degree, can be adjusted during production process. The backing ensures high indentation resistance, impact strength, electrical resistance and low moisture absorption of the coating.